The City of Cleveland is committed to becoming a more bicycle and pedestrian-friendly community, while reducing emissions from driven vehicles. These commitments, combined with world-class service provided by the Greater Cleveland RTA, are putting Cleveland on a path to a truly sustainable transportation network. As one sign of progress, the League of American Bicyclists has recognized Cleveland as a Bronze level Bicycle Friendly Community (BFC). The Bronze BFC award highlights our community’s commitment to improving conditions for bicycling through investment in bicycling promotion, education programs, infrastructure and pro-bicycling policies. 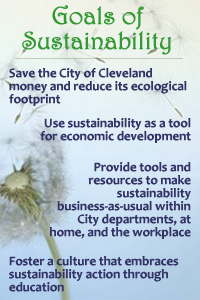 The City of Cleveland passed a Complete and Green Streets ordinance in September 2011. In effect as of January 2012, the ordinance requires implementation of sustainable policies and guidelines in all construction projects within the public right of way. This ordinance will create a walking, biking and public transportation-friendly city while reducing environmental impact by incorporating green infrastructure. Some characteristics of Complete and Green Streets include enhanced transit waiting environments, bicycle lanes and signs, pedestrial refuges, public art, waste containers, crosswalk enhancements, ADA accessibility, way-finding signage, permeable pavement, green space or trees and multi-use paths. In June 2012, City Council passed a bicycle transportation safety ordinance to help protect cyclists on the road. Among other features, the policy requires motorists overtaking a bicycle proceeding in the same direction to leave a safe distance, not less than 3 feet, when passing (commercial vehicles required to leave at least 6 feet). The City of Cleveland adopted an anti-idling policy in 2006 for the City’s fleet that states no City vehicle or piece of equipment be idled during non-emergency situations. This policy was followed up by an anti-idling ordinance in 2009. This zoning code update establishes requirements for bicycle parking to ensure adequate and safe facilities to accommodate bicycle parking, and to encourage use of bicycles for travel as an alternative to motorized vehicles. In 2013, Cleveland's Bike Share Task Force, with funding from the City of Cleveland and YMCA, completed a bike share feasibility study and implementation plan for operating a system in the city. The City is now working with Bike Cleveland, Cuyahoga County, NOACA, and other stakeholders to implement this plan. UH Bikes, Cleveland’s bike share system, launched in 2016 in partnership with Bike Cleveland, Cuyahoga County, NOACA, University Hospitals, and other stakeholders. Bike sharing in urban areas can positively affect how residents, employees, and visitors experience a city. Bike sharing allows more people to access cycling for short trips, replaces vehicle use, provides for fitness and recreation, and is beneficial for tourists and residents alike to explore a city. Metro Metal Works, funded through City of Cleveland and Dominion Foundation grants, is an innovative social enterprise that aims to promote bicycling as a sustainable and affordable means of transportation. The program also trains individuals from the homeless and community re-entry populations in employable skills. Those wishing to purchase a bike rack may contact them at 216.658.7218 or via email at sales@metrometalworks.com. Located at the Gateway Complex, the Bike Rack is built to LEED standards and features 50 bicycle storage facilities, showers and related facilities for commuters. The City of Cleveland has 62 hybrid vehicles, 15 compressed natural gas, and 91 flex fuel vehicles in its fleet. The City’s purchasing policy is targeting hybrid, alternative fueled vehicle, and electric vehicle replacements that maximize return on investment. The City of Cleveland is actively participating in an Electric Vehicles infrastructure readiness planning project titled ‘Charging Forward with Electric Vehicles in Ohio’, led by Clean Fuels Ohio. As part of this planning process, an EV awareness workshop was co-hosted by the City of Cleveland, Clean Fuels Ohio and Cuyahoga County in April 2012. The City initiated a Biodiesel Pilot project, which will test a 20% blend of biodiesel in the fleet. Biodiesel is comprised of processed vegetable oil or animal fat. Working with Earthday Coalition, NASA, and the Ohio EPA, the City promotes the use of locally grown and manufactured biofuels to reduce the use of conventional diesel fuels and harmful emissions.